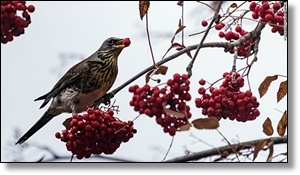 (CNN) Robins, cedar waxwings and other birds in Gilbert, Minnesota, are flying into windshields, bumping into trees and looking mighty disoriented. Police there say there's no need to worry -- the birds are just a little drunk. "It appears some birds are getting a little more 'tipsy' than normal," Gilbert Police Chief Ty Techar wrote this week in a Facebook post. No, the town's birds aren't downing worm-flavored margaritas. Techar believes their confused state is the result of eating berries that have fermented earlier than usual due to an early frost. "Many birds have not migrated south, so it appears to be more prevalent than in past years," he said. "Younger birds' livers cannot handle the toxins as efficiently as more mature birds." Yes, said Anna Pidgeon, an associate professor at the University of Wisconsin's Department of Forest and Wildlife Ecology, who notes it's not a rare phenomenon. "It's more typical in late winter, early spring when berries that have been on branches ferment due to the yeast that's on them," she said.